The JBL GO 2 is an ultra-compact speaker that’s waterproof and rugged. While its small size limits its audio potential, it can get surprisingly loud and has a handy speakerphone that makes it one of the most balanced ultra-compact bluetooth speakers. It's given that a larger speaker will sound better because it can pack larger and better sound drivers capable to fill in large area. However, speakers these days defy this rule of physics by punching way above their size, and JBL Go 2 is one of them. The JBL GO, similar to its predecessor, measures just 71.2 x 86.0 x 31.6 mm but it gets impressively loud. Considering its size, audio performance is good ... even if the bass response can't keep up with the clean-sounding mids and highs. At Rs 2,990, it offers an all-round feature rich audio experience with IPX7 certification, but its 5-hour battery life is a slight disappointment. Ditching its edgy design this time, the JBL Go 2 introduces curves on the corners this time and a tiny bulge on the grill and back. That not just makes it feel better while holding, but also freshens up the feel without differentiating it from the original Go speaker. You will typically find a clock on the exterior of most portable waterproof speakers these days, but the JBL Go 2 gets a rugged treatment with rubberized housing that feels durable. Also, if you're bored with similar colour tones, this one offers up to 12 peppy colour variants to choose from. There's a large JBL logo on the front and there's no back grille for passive bass radiators as seen on Sony SRS-XB411, but that's not a shocker looking at the size of Go 2. The speaker is small, but it does have thick sides like its predecessor. You get the power buttons on top of the speaker-- power, Bluetooth pairing, volume, and a multi-functional button that works as playback controls and a long-press activates your phone's voice assistant. Which obviously means there's a microphone that works while using voice assistance and taking calls. However, the sensitivity isn't the best we've seen. If you're away, more than 2 meters, then you might have to speak unusually loud to chat on a call. On the right of the speaker is a rubber door that hides the microUSB charging port and 3.5mm aux jack for legacy devices. It's well protected and there's zero to no scope of water leakage. Don't let its small size fool you, the JBL GO 2 can really crank the tunes. We found that 50% volume is comfortable for listening to music and pushing it to over 75% really offers a surprisingly full sound for such a small speaker. While bass is basically non-existent, mids and highs sound tight and smooth. The sound is quite narrow, which is expected from a mono speaker but other Bluetooth speakers do a better job of projecting music outward. Plus, the JBL GO 2 only fires sound forward which means if you sound to radiate evenly around the pool deck, you’ll want to get a 360-degree speaker. 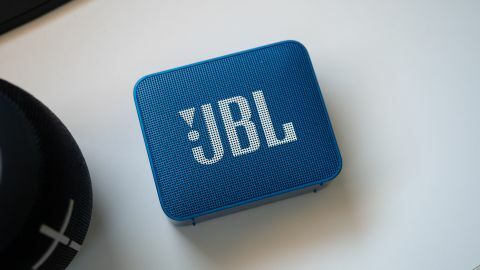 If you want the smallest portable Bluetooth speaker, the JBL GO 2 is a contender, especially for the price. There are bigger speakers that sound louder and promise a better battery life at this price, but being a known player in audio industry for so long, I would recommend this over those cheaper Chinese alternates going by different names. It's hamstrung by its physical size limits, sonic abilities and battery life but we were still impressed with how loud the speaker got.